Accordionist Gary Morin has been specializing in Italian, French, Irish, German, Polish, Big Band, Jazz, Tangos and Eastern European music since 1976. He studied accordion from 1971 to 1975 and went on to playing Weddings, Anniversaries, Holiday Parties right away. In January of 1976, after joining the musicians union, he began receiving many calls to play gigs. Gary has been booked for another year at the Italian Restaurant in Nashua, NH, not to mention for numerous other freelance jobs such as Weddings, Wine Taste events, concerts and many other events. Gary performs using Bugari Silver 150 and a Sonola SS4 Ernie Felice model. The Buagri accordion is now equipped with a new lemex mic system. These pieces are available as individual song sheets or as a package. Six new ones are in the works also. Plans are also underway for new CD's to be released. 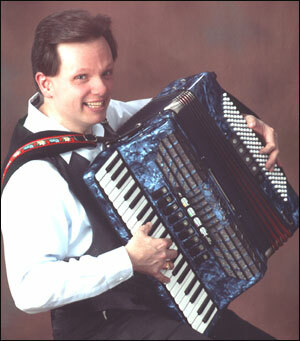 Gary is pleased to announce that this year he will be opening his new Gem Accordion School. This school will offer lessons for all levels, ages and styles. Please call or e-mail for lesson rates. Gary and his violinist Rick Bieniek look foward to another year of serving New England with their music from around the world including great standards, pop, show, classic rock, classical, jazz and more!